I have yet to find one person say they don’t like apple pie, the quintessential American dessert. If you want to know what American food is all about, I suggest you start by trying a really good piece of homemade apple pie. You will then know what heaven tastes like and I’m not kidding when I say that. A great apple pie has to have a rich, buttery pie crust, a nice, sweet caramel sauce, a great selection of apples and the right amount of apples and pie crust. Like I said in my previous post, I think I had to make close to or a little bit over 30 apple pies to find the recipe that would be part of my recipe book. And I tried them all. Most of them were good and many of them were not amazing, which is what I was looking for in the recipe. 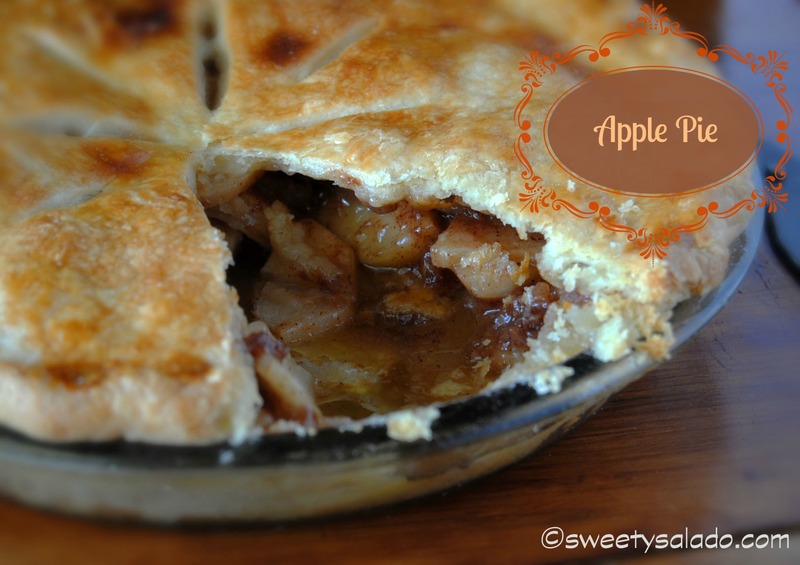 I have tried making it with all kinds of different apples, adding all the dry ingredients to the apples before putting them in the pie plate, and even using melted caramel sauce and believe me, every single apple pie I tried was pretty good but again, not amazing. Until I found the one that spoke to me and of course to my husband, who’s the person who can devour one whole pie in one day all by himself. The reason why this recipe has that amazing factor is the fact that you create a simple caramel sauce with sugar and butter and then pour it on the apples. It’s simple, easy and out of this world fantastic. 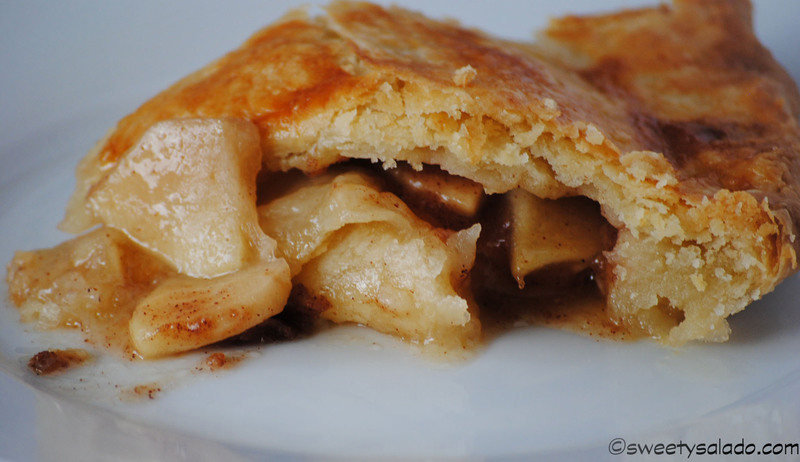 I love using Gala apples for my pies because they are not too sweet and not too tart. Most people love using Granny Smith apples which I personally think are too tart and others love using Fiji apples, which I find to be too bland, so that’s why I always stick with Gala which are sweet and mild in flavor. As for the amount of apples to use, you can use as many as you want. I choose to use between 4-5 medium size apples because I also love the flavor of my pie crust and I don’t want one flavor to overpower the other. But as with any recipe, make it your own, make your own changes, if any, in the end you won’t be disappointed. 1. Pre-heat over to 425ºF (220ºC). In a small saucepan melt butter at medium low temperature, then add white sugar, brown sugar, water, cinnamon and cornstarch. Stir well to mix all of the ingredients. Reduce heat to low and and let simmer. Meanwhile, peel and cut apples into slices. Put apples in a bowl and cover with lemon juice so they don’t turn brown. 4. Place one pie crust on the pan (you can grease and flour it beforehand if you prefer). Then, add the apples and cover them with the hot caramel sauce. Cover the apples with the other pie crust, seal the edges and cut steam vents on top. Optional: brush slightly with the beaten egg to make it shiny and sprinkle with white sugar. 5. Bake pie in the pre-heated oven for 15 minutes. Then lower the temperature to 350ºF (180ºC) and bake for another 40 minutes. 6. Let pie rest for at least an hour before serving so the caramel thickens. You can serve it with vanilla ice cream or homemade whipped cream. You can bake the pie on a cookie sheet to protect your oven in case the caramel oozes out. If you see that your edges are burning, you can cover them with aluminum foil to protect them. You can substitute the beaten egg with cold milk. Yum, your pie sounds so good, love the sound of the caramel sauce with it!